I love the colors in the peacock feather. I have had this idea to come up with a peacock feather pattern for a LONG time... at least 6 months. After our move and things finally settling down, I was able to sit down and come up with the pattern. I had to make MANY different versions before I was satisfied with the accuracy and neatness of the pattern. I hope you LOVE it! Using H hook and materials listed feather should be about 4” tall and 3” wide. Tr: Yarn over (twice), insert hook in stitch, yarn over, draw yarn through stitch, (yarn over, draw yarn through 2 loops on hook) 3 times. Round 1: WITH COLOR A: In magic loop, ch 3(counts as dc) and dc 8 (9 dc total), CHANGE TO COLOR B and dc 3 more times in magic loop. Pull tail tight to close loop. Round 2: Continuing with COLOR B, immediately sc in top of ch 3 of color A. Then 2 sc in next ch, 1 sc in next, 2 sc in next, 3 hdc in next, 2 sc in next, 1 sc in next, 2 sc in next, 1 sc in next, sl st to join and fasten off. Round 3: Ch 1 and sc in same st, sc in next 2 sts, 2 sc in next, sc in next, hdc in next 2 sts, 2 hdc in next, dc in next, 2 dc in next, 2 tr in next 2 sts, 2 dc in next, dc in next, 2 hdc in next, hdc in next 2 sts, sc in next, sc in same ch as first sc, sl st to join and fasten off. Round 4: Ch 1 and sc in same st, sc in next 2, 2 sc in next, sc in next 2, 2 sc in next, hdc in next 6 sts, 2 hdc in next, 2 dc in next, 3-picot, 2 dc in next, 2 hdc in next, hdc in next 6 sts, 2 sc in next, sc in next 2, then sc in the first ch of the row, sl st to join. Fasten off. Make a whole bunch and sew them together to make amazing gifts. I have seen them made into earrings, headpiece, or blankets. Post links in the comments of things you've made, I want to see! 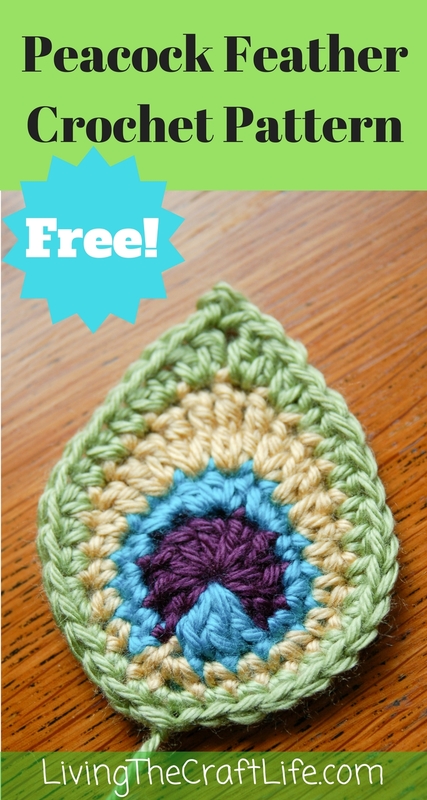 If you are having trouble figuring out the pattern, you can purchase my 16 page step-by-step photo tutorial on etsy. 2/4/16 Edit: WELCOME DIYSMARTLY FRIENDS! I saw my pattern was linked on a page referring to a beautiful peacock feather blanket. Please notice that this pattern is for the motif only, not the blanket, nor is it the same pattern from the video posted on their page. The blanket pattern can be purchased from the person who designed the blanket. I only designed the single motif. Thank you! I looked at you're blog, you have some amazing ideas - loved them. I will return and have another look. You can check it at http://www.pinterest.com/alekcahdra/magana/. i love that idea concept!! I would love to have you visit me.Have a nice day. This is the best and most realistic peacocks feather I've seen,I have a peacock,so I know the pattern,and you have it exact.Will make a bag,then will make the feathers,and if it is OK with you,I would love to send you a photo,and if Percy(the peacock)is around,I will include both. How did you join them to make a blanket? Would it be possible to make a video? Thank you! you could sew them onto a piece of hemmed fleece or make a croched blanket then srw them to blanket. Sew onto a piece of Fleece...that genius! It would save on time, money, and make it weigh significantly less!!! Like Lizziloo, I am a connoisseur of peacocks and their wonderful feathers. Your pattern is SPOT ON! I will probably shop around for METALLIC threads to use in deeper, more jewel-like (and more PEACOCK-like) colors, and I will be blessing you the whole time: You saved me the energy and frustration of trying to figure a pattern out myself. (Not to say I could have done half as well as you) You thought YOU had been pondering a peacock feather pattern for a long time—well, for me it has been seven YEARS! Thank you so much for halting my progress-or lack thereof! And thank you so much for sharing the results of your time and talent. I am slow at most things, but I will send pictures! which blanket pattern did you use? This pattern is only for the motif. I did not make a blanket with them. How do you join them? There are lots of ways you could join them, but I haven't done any. You could sew them overlapping, or separated from each other, depending on your design. How many sceens did you use to make this blanket as pictured? I did not make a blanket with them, so I wouldn't know. Sorry I couldn't be more helpful. What is a magic loop? You didn't include that in your instructions. These look awesome do you know where we might look to create a blanket or do we just sew them on a crochet blanket? a single feather takes me about 15-20 minutes, depending on how carefully I want to sew in the ends and finish off. did you ever make the peacock blanket? A 3-Picot is as follows: chain 3, sl st into 3rd ch from hook. How much yarn did you use to make just the feathers? Thank you for providing the directions for free. How do you join them together? What is a size H hook? And is it British crochet terms or American or something different? Hi! I am having trouble finding the Passion color way of the Caron. Do you have any suggestions for substitutes? Thank you! Hmm, it appears that "Passion" used to be a part of their collection line. I still have two skeins of it! Looking at a peacock feather, you could probably get away with Caron's "Dark Country Blue", "Ocean", or just plain ol "Purple". It's a bummer you can't find that color anymore, I love how vibrant it is! I have also found that Red Heart's Soft yarn has the same weight as Caron's Simply Soft, so if they have a comparable color you could use that brand. I am using sage and iris in place of the pistachio and passion. Very close and looks wonderful with the bone and blue mint. So beautiful! God has given you a gift! I am sending to my Aunt, she will love this! Round 1: WITH COLOR A: In magic loop, ch 3(counts as tr) and tr 8 (9 tr total), CHANGE TO COLOR B and tr 3 more times in magic loop. Pull tail tight to close loop. Round 2: Continuing with COLOR B, immediately dc in top of ch 3 of color A. Then 2 dc in next ch, 1 dc in next, 2 dc in next, 3 htr in next, 2 dc in next, 1 dc in next, 2 dc in next, 1 dc in next, sl st to join and fasten off. Round 3: Ch 1 and dc in same st, dc in next 2 sts, 2 dc in next, dc in next, htr in next 2 sts, 2 htr in next, tr in next, 2 tr in next, 2 dtr in next 2 sts, 2 tr in next, tr in next, 2 htr in next, htr in next 2 sts, dc in next, dc in same ch as first dc, sl st to join and fasten off. Round 4: Ch 1 and dc in same st, dc in next 2, 2 dc in next, dc in next 2, 2 dc in next, htr in next 6 sts, 2 htr in next, 2 tr in next, 3-picot, 2 tr in next, 2 htr in next, htr in next 6 sts, 2 dc in next, dc in next 2, then dc in the first ch of the row, sl st to join. Fasten off. Thankyou Jo, I was having trouble with the translating it too! and was confused by the video as it only has 3 rows & 3 colours but the pic has 4. thanks again. How many rolls of each yarn would I need? if you wanted to make the blanket you could start with one skein of each and see how many feathers it makes to make the blanket. Or you can purchase the pattern from the link at the top, she might list how much yarn to get to make the blanket. This pattern is only for a single motif. I am confused on round 2. After you join with a sc in the 3rd ch (starting dc of round 1) it says to 2sc in next ch. Which ch is that? The 2nd ch of the beginning dc of the first round? I don't see where there are any other ch stiches up to this point. It does mean the next stitch. You should be starting the next row into the previous row's stitches. I am working on updating all of my patterns to clarify that use of "ch". I am still learning with crocheting different things and am still learning with reading patterns so maybe it is me. Is the written pattern you have listed here for the feather and the video for it different because I have already made one watching the video and decided to make one from reading the pattern but it is different and I really like how it has part of the second color go down into the first color but I can't seem to figure it out. ok so then I would add the second color in then sl st it to the beginning of the beginning color then? Thanks for sharing this. I am working on these now, but I had a problem with the pattern as you go to connect the blue it doesn't tell you to place 3 double crochets into the center of the circle . I figured it out by having crocheted most of my life. I hope everyone else figured it out. I like the pattern and intend to make an afghan out of mine, also making some smaller and larger motifs. Hello,I think I may be able to help you. I am thinking if you attach them in a circle you could put candle holders or something in the middle. Then you could sew them together to form a blanket. I can picture this in my head. I am working on the peacock blanket right now let me get a few feathers done and I will send you pictures of what I mean. If you have Facebook visit my page and send me a message. I think I can help you figure this out. 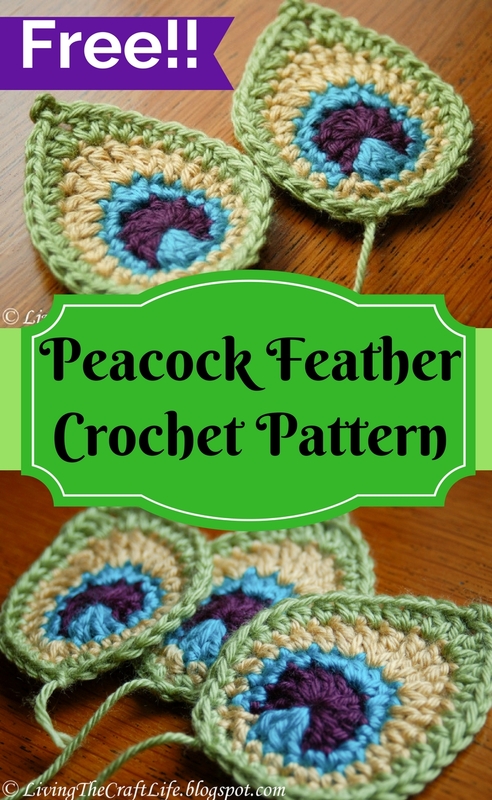 Love your peacock pattern - thanks for sharing. How much yarn of each colour do you think it would take to make 100 of these? Лучше бы со схемой..удобнее было бы.. So beautiful 😍😍 is it okay with you if i translate it to Danish? You are welcome to translate it, as long as you include a link to the original post. Thanks for your effort in spreading this fun pattern! I have never crocheted before but I absolutely love this pattern and want to learn how to do it. Is there a video available on youtube or elsewhere that could help guide me? Thanks! I would love to make a number of these and turn it into an afghan, but I have one question... round one, it says "with color A: in magic loop, ch 3"...what is a "magic loop"? I didn't see it listed in the materials and I've never heard of this before. Thanks! oh! OK, I get it now! That's how I usually do it, I just never heard it called a magic loop. Now I know. Yes, you're right. I've heard it called "magic ring," "magic circle," and "magic loop." Not sure which is the official name! Thank you! Here are my pictures; I like how the turned out! I used size10 cotton string, but don't ask for the specific colors cause they didn't have a lot and I grabbed the best I could. I have spent more time trying to read the pattern for this motif than actually crocheting it. After trying to rewrite it to make it less wordy, I have decided to learn to write charts. Thanks for the incentive. BTW, I'm using Caron SS Pagoda and Blue Mint and KnitPicks Brava in Alfalfa and Avocado, all from my stash. May I use this as the basis of a sleep mask project? It would be posted on my blog with a link back here. Absolutely! I would love to get a link to see the finished product! Did you use uk or us crochet terms ??? I'm a bit confused with the 3-picot stitch on row 4. Would someone be willing to post a video on this particular pattern? I've looked it up on YouTube but nothing is making the single point at the top of the feather. Thanks in advance. Help!!! Does anyone know just how to attached the feathers to one another and to the background blanket? I love, love, love this pattern! I am using different size crochet hooks and so far my fav is the feather made with a 4.0 mm hook. I am making these for the Soulspace farm animal sanctuary in New Richmond, Wisconsin. One of their residents is a most handsome Peacock named Francis! The crochet feathers are gifts to the visitors! Thank you for sharing this most wonderful pattern!!! !